Well, we have had our RV for over a week now and have been planning customized upgrades to make the interior fit our family’s needs best. 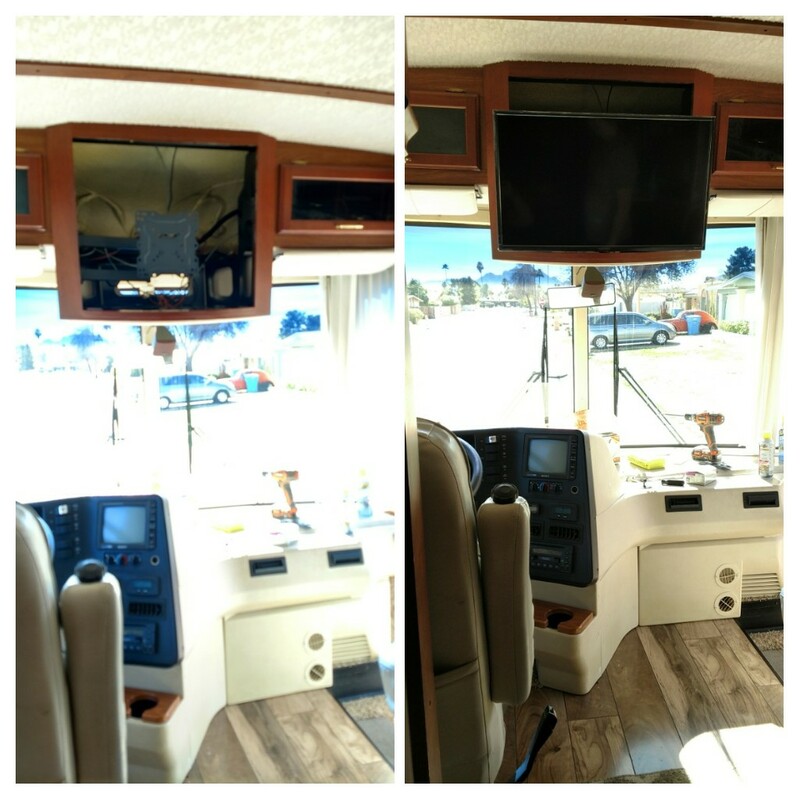 When we first purchased the RV it came with one of those old school, super thick 50 pound TVs…so that had to go. You will see we completely removed the TV by the time I got a good picture and we replaced it with a 32-inch Insignia Smart TV, which is super light, about eight pounds, with amazing quality. The other major project we had to tackle was converting the master bedroom closet into a room for our toddler. She will need her own space for quiet time and sleeping and we also want her to feel like she has a special area of her own in our mobile house. 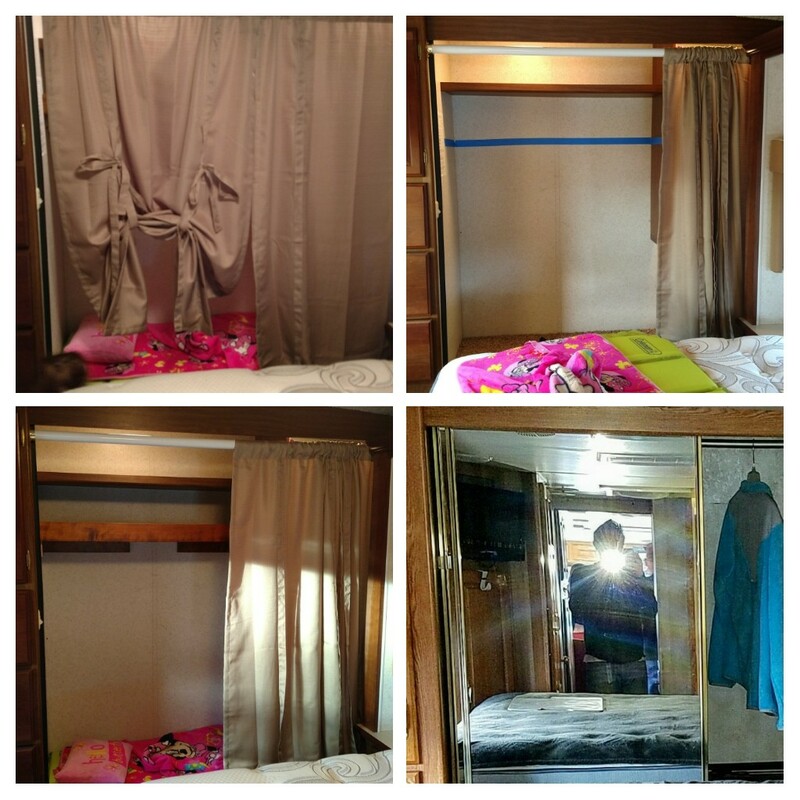 When we first bought the RV the master closet had two large sliding glass panels. So we ended up taking those out, removing the tracks, and installing a custom rod across the top…we decided on curtains to close in the closet area and create a space for our toddler. We purchased a custom bed for her which is basically a glorified air mattress and a sleeping pad which we will probably put additional padding underneath to help keep her warm and insulated. There will be more customized updates to her little area but at least the base is here now. We also added an additional storage Shelf which gives us more room for a close but still allows our toddler to stand up in the closet. What a productive weekend!! Very cool! You guys seem like you have great ideas! If you want anymore check out our blog. I can’t wait to hear more about your adventures!